The quick, easy-to-fix way to tie-in new walls to existing walls without cutting out brickwork. 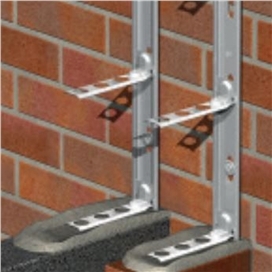 Suitable for walls of up to 3 storeys high, ie up to 8m maximum. Wall Starters Individual flanged products designed for specific widths of new walls. UniStarters The universal wallstarter for any wall. The flat flange-free design means they can be used to construct any wall between 75mm and 250mm thick. Multi-Starters Featuring a ‘turn-n-slide tie’ to accommodate all sizes of brick or block. The Multi-Starter is suitable for all wall widths from 60mm-250mm.